With so many awesome restaurants opening in Lower Parel, this place is definitely becoming a ‘Good Food Central’ soon. 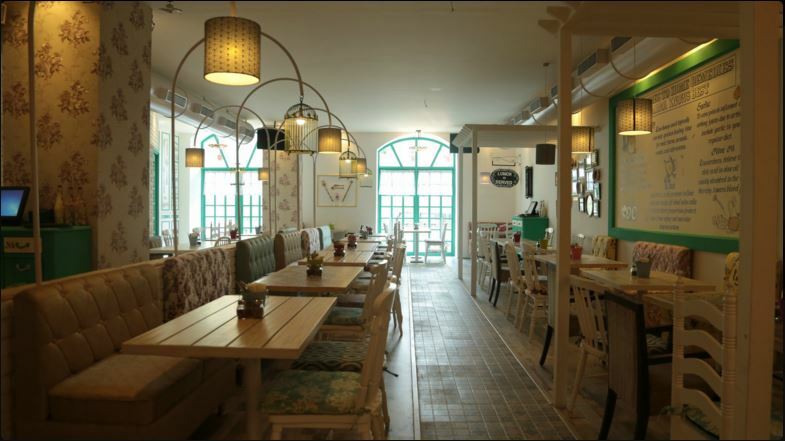 A very fresh entrant to the list is this cute place, recently (about 3 days back) opened in Kamala Mills is ‘Grandmama’s Café’. The first thing that will give you an idea of what you’re going to experience at this place is the calm & beautiful ambiance – standing true to the restaurant’s name. We reached the place at 12.30 pm on a Friday afternoon and the place was decently full. For a place just 3 days old, this is very surprising and gives a good message. The menu is currently very limited but decent, however they have an extensive menu planned, once the place is fully operational. Can’t wait for them to start serving Italian, Bombay & Parsi Grandmama’s special. Menu is fairly priced and the service was quick. Though, I thought the servers were a little clueless about the menu. I don’t want to judge that yet, as again, the place is just 3 days old. We started our Grandmama special gastronomic journey with Hummus – Flavored Chickpea paste with paprika, vegetables & pita. The Hummus was flavorful and was indeed a good start. 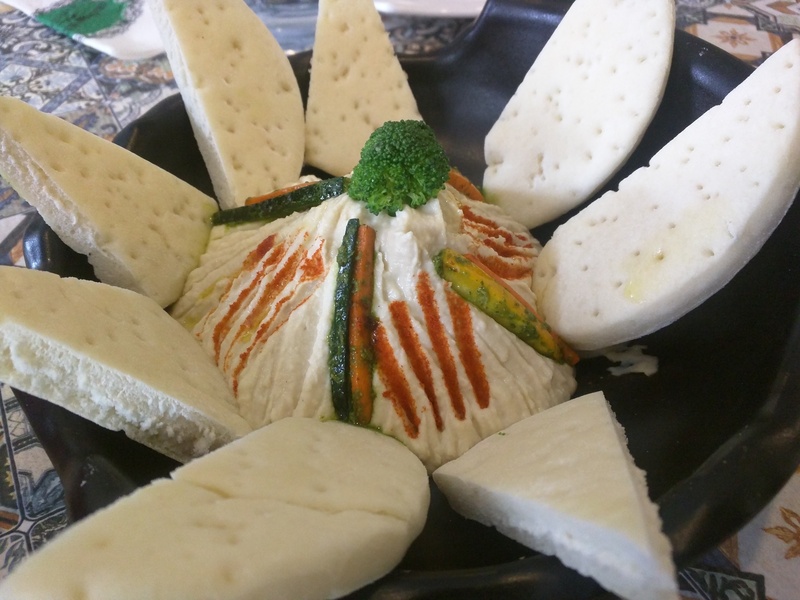 Don’t expect too many vegetables with your Hummus, like we did – this comes with just a piece of Broccoli and 3-4 strips of Carrot & Zucchini. I couldn’t have enough of the Hummus and paired it with most of the dishes on the table. 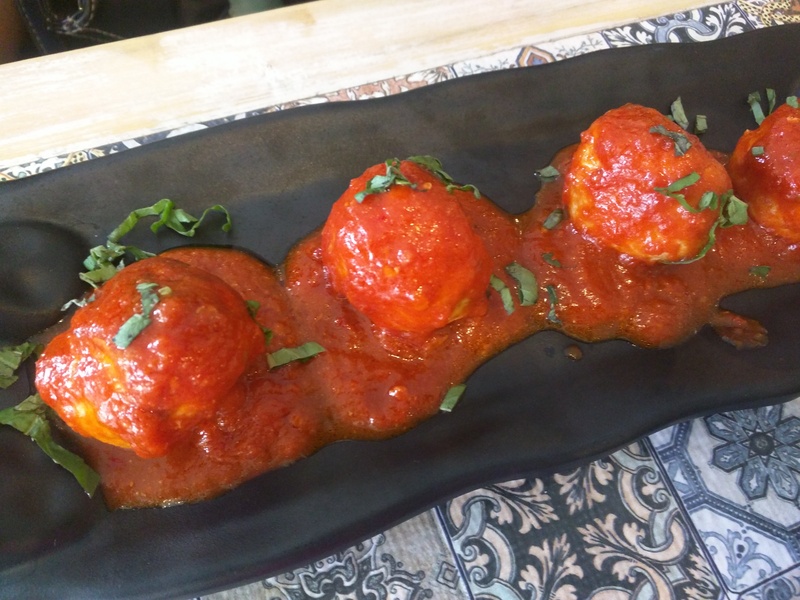 Next up was Grandmama’s Meatballs – Chicken Meatballs tossed in homemade tomato sauce with smoked paprika and almond flakes. The flavorful sauce went so well with the soft & juicy meatballs. 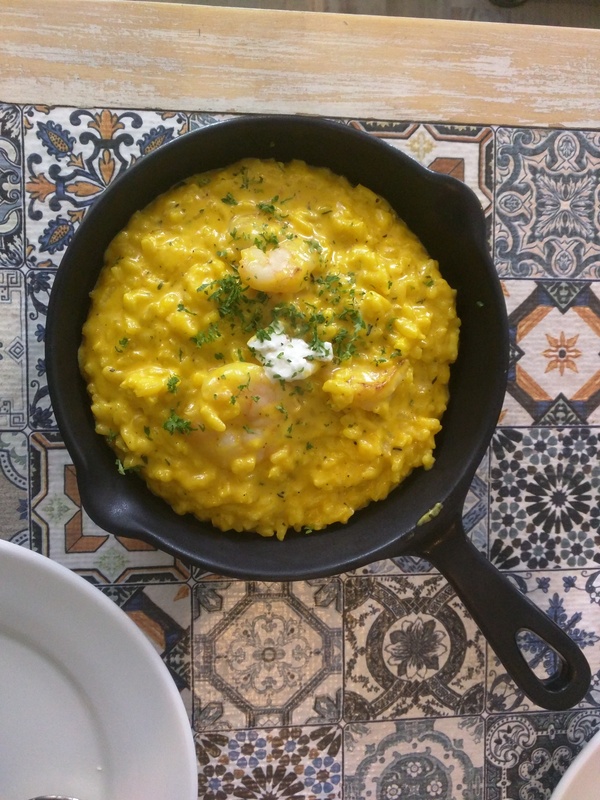 Next was the Saffron & Goat Cheese Risotto – Risotto infused with saffron and whipped goat cheese. I opted to add prawns to my risotto. I’m totally a risotto person, and this couldn’t get any better – flavorful, creamy and not very heavy. While the risotto’s quantity was perfect, I thought paying 100 bucks extra for just 3 pieces of prawns was a little unreasonable. One of my colleagues who was accompanying me, called for the Bombay Grill – Masala potatoes with mint chutney & our very own Amul Cheese. This will definitely take you back to your grandmama’s kitchen – so simple. For me, this took me back to my college days and made me think of the Masala Toast from Jai Sandwich. A simple dish with no unnecessary frills attached. I called for a Lemon Grass & Mint Green Tea, and after tasting what actually came to the table, I wouldn’t recommend this at all. 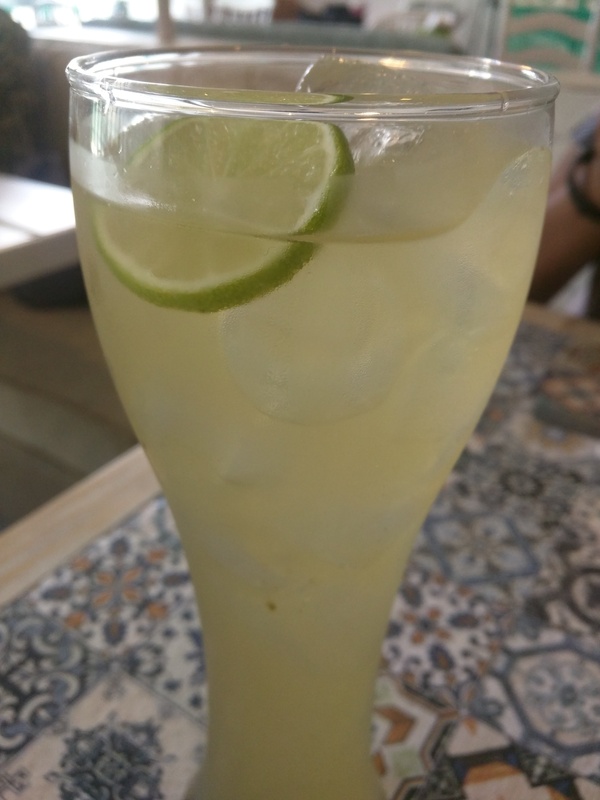 The drink was so sweet for my palate that I confused it with plain lemonade. It had zero existence of Lemon Grass or Mint, I thought. 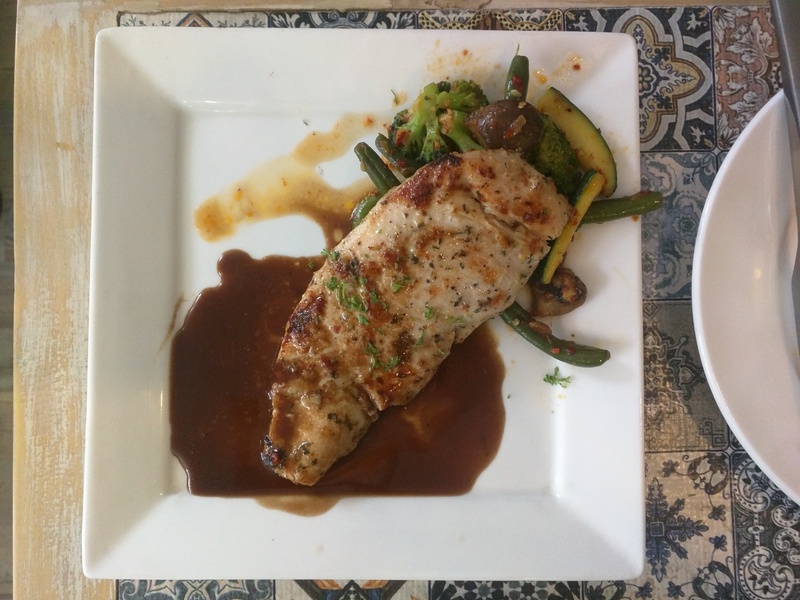 This was followed by the Home-style Grilled Chicken – Grilled chicken breast with red wine jus & mash potato. The chicken was well marinated and the sauce tasted different – imagine wine with a hint of herbs. 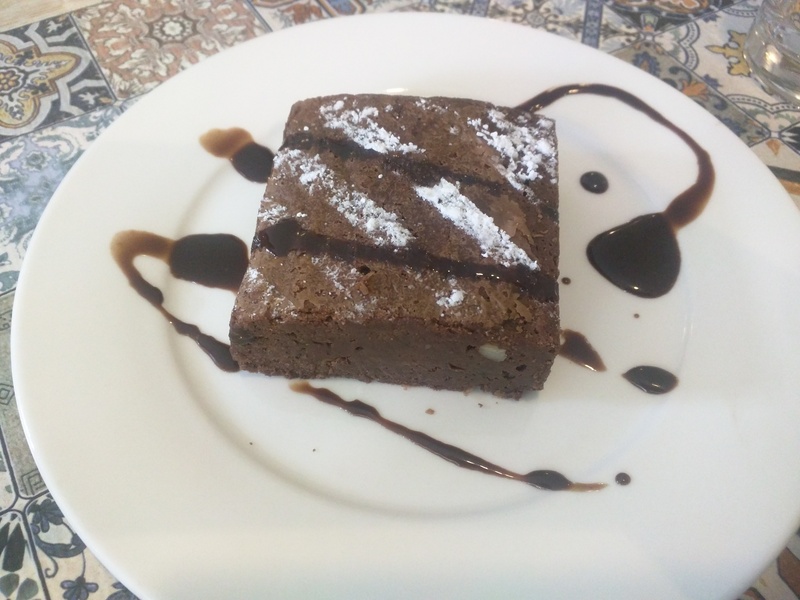 We ended the meal with Grandmama’s special Walnut Brownie, which was drizzled with some chocolate sauce. Warm, soft & not too sweet – this marked the perfect end to our meal. All in all, if you’re looking to indulge in some flavorful food in a good ambience and don’t want to spend too much, this is the place to be. I am definitely doing an encore and I urge you to take the Grandmama special gastronomic journey soon, too. We spent approximately Rs. 500 per person. Last Minute V-Day Planner – Top Picks for an Ideal Date with Your Special Someone, This Valentines! ← Last Minute V-Day Planner – Top Picks for an Ideal Date with Your Special Someone, This Valentines!